But, we've definitely thought out every nuanced ramification of at least one dinosaur hybrid creation. This one might be the brightest and hungriest of all the dinosaurs we've ever brought back, but it is also the cuddliest one imaginable! 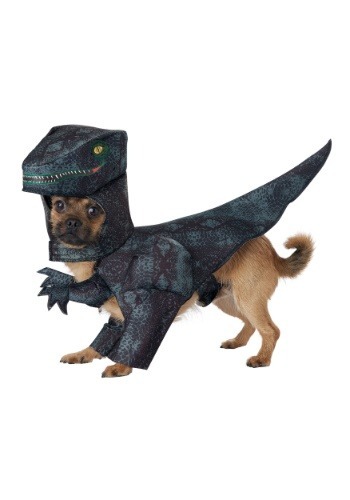 Enjoy your own version of the dinosaur theme park when you give your pet this Dog Pupasaurus Rex Costume. This reptile-like green scaled coat is a comfy harness and hood for your pupper that will make them look like a raptor on the prowl. The dinosaur arms, head, and tail all extend from the base coat to give your pet a real toothy grin and extra adorable arms. Ever since the Stone Age, folks have been anxiously awaiting the day that they might have a dinosaur pet of their own. We might still be a few years off from such genetic opportunities, but this Pupasaurus Rex Costume will give you and your dog the vicarious thrill of being a raptor on the hunt for treats!